Dr. Trang was one of Cao Thang Eye Hospital’s first doctors. She joined Cao Thang Eye Hospital in 2003 and has been a central figure in the development of the hospital’s LASIK program. In 2015 Dr. Trang was named Head of Cornea and Refractive. Prior to joining Cao Thang Eye Hospital, Dr. Trang worked in the Trauma and Paediatric department of Da Nang Eye Hospital, and part time at FV Hospital. Doctor Trang graduated from Hue Medical University in 1997 and completed a Specialist Level I in ophthalmology (equivalent to Master of Ophthalmology) at the Ho Chi Minh City University of Medicine and Pharmacy in 2003. Dr. Trang has taken numerous courses and certifications as part of her continuing professional development. In 2011 she attended the SNEC Advances in Refractive Surgery and Basic LASIK course as well as the HCMC Eye Hospital Advanced LASIK Surgery course. In 2014, Dr. Trang was trained in performing Z-LASIK and Z-LASIK-Z surgeries with the Ziemer Femto LDV Z Models. She has also attended the Wavelight LASIK course at the International Specialist Eye Centre in Singapore and the LASIK surgery training course by Nidek Ltd as part of her continuing professional development. 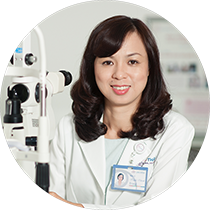 In 2017, Dr. Trang completed and obtained a Certificate of Oriented Ophthalmology Training by Cho Ray Hospital. Dr. Trang is a member of HCMC Ophthalmological Society and the Vietnamese Eye Bank and of the Asia-Pacific Association of Cataract & Refractive Surgeons (APACRS). • The ASEAN Association of Eye Hospitals 10th Anniversary Meeting, Kuala Lumpur, Malaysia, 2014; and numerous domestic conferences and meetings. • Descemet-stripping lamellar endokeratoplasty (DSEK) and deep anterior lamellar keratoplasty (DALK), innovative approaches to corneal transplant surgery conference, 2017.